Bike didn't come with luggage so i'm giving it consideration, i already have a Givi Trekker topbox, so my consideration is panniers. 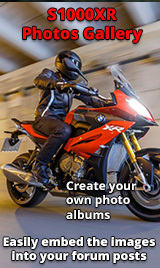 Who uses what on their S1000xr ? do they carry a pillion and does the luggage make life difficult for their pillion. I came from a Triumph Explorer, the New Explorer gives a pillion little room if using OEM panniers according to some owners, obviously depending on the size of the pillion. Mrs Teutonic and i spent a weekend away last weekend and used soft panniers, not ideal but it worked. Givi Trekker would be the obvious choice, although I'm not sure they suit the bike. I went for Givi Trekker Dolomiti panniers, on quick-removal racks, and think they suit the bike better (a smoother profile). Don't carry a pillion, but don't see them as being problematic. I posted some pics in the luggage thread, but suspect they might have disappeared off Photobucket now. I would agree the Trekker boxes wouldn't be my first choice either, something like the V35 would look better and have a more aero profile. Can't comments on the pillion space as not had a pillion with the panniers on the bike, Can't see why they would compromise the space though. I have the Kappa K33 which are the same as the Givi V35. They look nice on the bike, have a good capacity (although the shape of them doesn't allow storing a helmet) and they fit in close to the bike. They are narrower than the handlebars which helps a lot with filtering. I have used the Givi quick release racks which when removed from the bike are very discreet and the mounting hardware is barely noticeable. Appreciate the comments, food for thought. Thanks for the link Forestboy, i'm liking those colour coded panniers, they do look nice. I'm swayed more towards the aero type boxes than the adventure type, i know the pro's and con's having been there with other bikes so i won't prompt a debate on that. I have the Shad kit on mine. It looks good on the bike I reckon and the mounts blend well with the bike when panniers are removed - unlike the BMW frame arrangement. I can vouch for them being fully waterproof after a 6 hour ride in torrential rain in France.